Well it certainly is that time of the year again, am I right? The most wonderful time of the year is upon us! Soon our schedules will be filled with Holiday parties, looking up new recipes to cook for gatherings, baking cookies and of course, lots of shopping! Pat and I are trying to figure Thanksgiving and I have begun to text friends to see when they will be home for Christmas! I am so excited! The holidays bring a lot of travel for Pat and I. We live a 7 hour drive from home, and I think the best way to be ready for the trips and all of the places we have to be and all of the people we have to see is to be prepared. That’s why I am starting early this year & below I have my top 10 steps to ensure I will be full prepared for the Holidays and will be able to relax during them! 1. Thanksgiving & Friendsgiving: You always want to be able to bring something yummy to these gatherings. Begin to hunt for a few recipes on Pinterest. Create an “Easy & Quick” recipe board so if you get in a jam, you’ll already have a few go-to ideas! 2. Think about what you’ll wear for each Holiday early. I know for me, when I travel somewhere and only have a limited amount of space to bring the essentials, it’s nice to have already thought about what you’ll wear on these big days! Christmas Eve is far more formal than Thanksgiving & Christmas Day for my family so I’ll start looking for a nice dress or skirt& blouse soon! The other days, jeans and a sweater will do! 3. Do you travel for the Holidays? Be sure to start creating a mini stack of items and things that need to go home with you. I always have something I picked up for my Mom, paperwork that needs to be stored in my parent’s filing, something I took from home last time I was there and need to return, etc. You never know, but you’ll most likely forget if you don’t jog your memory now! 4. Place a $20 bill in an envelope & place it in your glovebox. I can’t tell you how many times I have traveled and Pat and I are so happy we had extra cash in the glove box for those darn tolls! We never carry cash on us, so it is the most annoying thing if we have to add running to an ATM the night we are leaving for the trip due to driving on toll roads! 5. Begin making a list of the people you want to buy gifts for and start jotting down gift ideas next to each name. You will feel so much more focused shopping during the craze of Black Friday and then during Cyber Week. Plus, ensuring you are preparing early, you’ll be able to compare prices and save some money! 6. Buy all wrapping paper, Christmas cards, ribbons and bows early. I may or may not have already purchased these necessities….I blame this on Home Goods! Also, write your Christmas cards early so when the gifts arrive, you’ll just need to wrap and stick the card with the present! 7. Make a list of the people you must see. Okay, let me explain this one throughly. Pat and I both come from big families. It is often a lot of people that we want to see + all of our really good friends from home. We always see everyone in our families over the few days we are home, but sometimes it’s hard to see all of our friends. You might think I am crazy, but I have a list of about ten friends that Pat and I really want to see. Most of our friends, like us, went all over for school and our first jobs. It’s hard to keep track of who will be home from what time to what time. I already solved this by texting all of our friends and asking when they’ll be home. Once we get close to each holiday, I literally write down everyone’s availability in my agenda and plan a big gathering or a night out. Come on, there is always an organizer in each group and that is certainly me! I want us to see all of our friends! 🙂 My advice: Be the organizer! 8. Pack for each holiday a few days in advance so you’ll be sure you aren’t forgetting anything. Not going anywhere but hosting? Begin to clean several days in advance so you don’t feel stressed in the last minute trying to get everything done! 9. Specifically for Christmas, be sure to get all of the shopping done a head of time. I always aim to be done two weeks before Christmas so I can wrap as the gifts are delivered to my front door. I only online shop, it’s how I get everything I want at the right price! 10. Finally, you have done everything from steps 1-9 so just enjoy! The Holidays are a time to gather all loved ones together and to celebrate how grateful we are to see the people we love, to be able to have the things we have, and celebrate what an amazing life God has given us! Here’s to Holiday planning. Cheers! 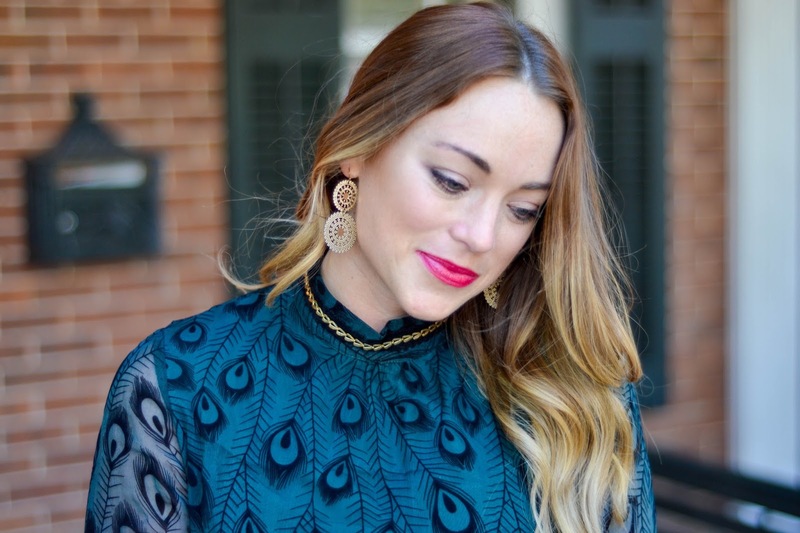 See below for some of my Holiday Party looks…helping you with #2 already! 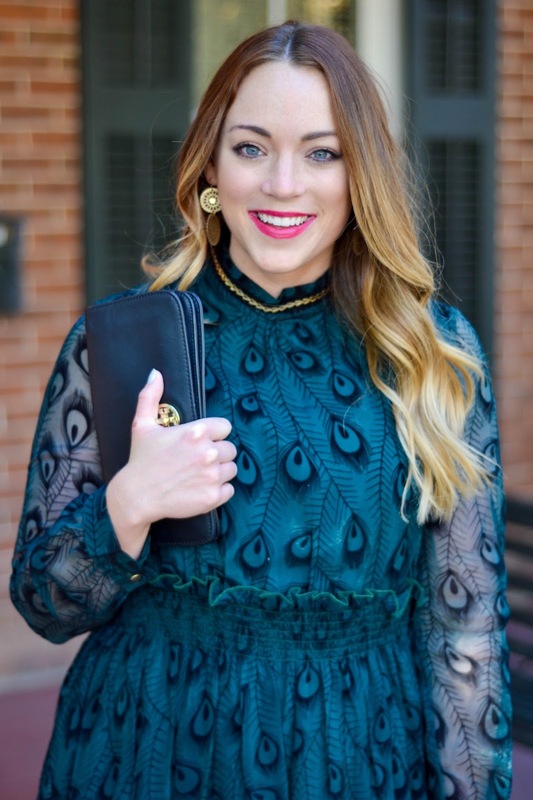 Adorable Holiday Party Look! I am in love with this peacock themed dress. At domestic Los Angeles event venues my sister is getting engaged and I would like to have this cute outfit to attend her party. Thanks for sharing link to buy this dress.